It's fine for us to have a debate about how the best way to get there is, but to suggest somehow that I'm not interested in having everybody covered, or to suggest, as Hillary just did, that I was in favor of single payer, I never said that we should try to go ahead and get single payer. What I said was that if I were starting from scratch, if we didn't have a system in which employers had typically provided health care, I would probably go with a single-payer system. 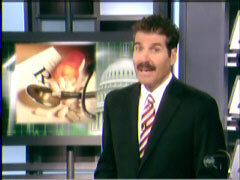 During the six-minute, 20-second segment, Stossel informed viewers of the long waits patients must endure in countries with government-run health systems - like Canada and Britain. He recounted that some patients - including world leaders and wealthy celebrities - come to America for treatment of serious conditions, and relayed the case of one Canadian woman who came to America to treat a clogged artery whose American doctor told her she would not have survived waiting a few more weeks for Canada's government health care. Additionally, Stossel found that even patients waiting in emergency rooms in Canada have to wait an average of 23 hours for service. Stossel recounted the case of a Canadian town with so many people waiting in line to be assigned to a family doctor that each month a lottery chooses four lucky residents. And in England, the shortage of dentists leads some Britons to pull their own teeth or try to repair problems on their own. STOSSEL: -available all the time. UNIDENTIFIED FEMALE VETERINARIAN: If I see a patient that's torn a crusciate ligament in that patient's knee, we can generally have that patient scheduled within probably a week. STOSSEL: But you have to bark or meow to get that kind of treatment. Want a CT Scan in Canada? Private vet clinics say they can get a dog in the next day. For people, the waiting list is a month. JOHN STOSSEL: Some in Congress say they're moving closer to a plan that will make health care cheaper and better. Sounds great. But when government takes charge, it can also mean innovation stops, and you may not get the breakthroughs and care that you need to save your life. BARACK OBAMA IN FRONT OF AUDIENCE: -affordable health care for every single American, that's what we're called upon to do. STOSSEL: Care for everyone, for less money. Critics say that just isn't possible. SALLY PIPES, PACIFIC RESEARCH INSTITUTE: The only way they can get costs down under a government-run system is to control the amount of money that is spent on health care. But there is much more of a demand for health care than the government is willing to pay for. We will have long waits for care just like they do in Canada and in Great Britain. STOSSEL: Those countries do have problems. STOSSEL: In England, people wait just to register for a dentist. Waits are so long, some people do it themselves. He used superglue. Some pull their own teeth. Dental tools - pliers and Vodka. Patients protest because the health service won't pay for drugs they say they need. The President says he doesn't want that. OBAMA: -you hear the naysayers claim that I'm trying to bring about government-run health care, know this: They're not telling the truth. OBAMA, FROM DEMOCRATIC PRIMARY DEBATE: I would probably go with a single-payer system. STOSSEL: He says he doesn't want government-run health care. PIPES: He does want government health care. He just wants to go about it in a slow way so people don't realize what's happening to them. STOSSEL: Many pundits and economists agree, saying Obama's plan will build "a bridge to government-run health care." PIPES: -and we're all going to face long waiting lists and have lack of access to the latest care. DOCTOR DAVID GRATZER, AUTHOR OF THE CURE: People line up for care, some of them die, that's what happens. STOSSEL: Canadian Doctor David Gratzer thought Canada's government health care was great until he started treating patients. STOSSEL: People wait in line? GRATZER: You want to see your neurologist because of your stress headache? No problem. You just have to wait six months. You want an MRI? No problem. Free as the air. You just got to wait six months. STOSSEL: But Canadian doctors told us their system is cracking. This man had a heart attack. UNIDENTIFIED MALE DOCTOR: What did they tell you about when an ICU bed might become available? UNIDENTIFIED MALE PATIENT: They're waiting for the chance that somebody may be transferred so that I can get that spot. STOSSEL: In America, people wait in emergency rooms, too, but in Canada, if you're sick enough to be admitted, you wait an average 23 hours. UNIDENTIFIED MALE DOCTOR: You can't send these patients to other hospitals that have capacity because there is no other hospital in the area that has capacity. STOSSEL: There was no bed for this little girl, and she had no pediatrician that her parents could take her to to monitor her seizures. In fact, 1.7 million Canadians say they can't get a family doctor. Some towns, like this one outside Toronto, hold a lottery. Once a month, the town clerk gets this box out of the closet. Inside are names of everyone who wants a family doctor. She pulls out four slips and then calls the lucky winners. UNIDENTIFIED WOMAN ON PHONE: I just wanted to let you know that your name has been drawn for Dr. Keel's patient list. Oh, you're quite welcome. STOSSEL: Others in town must wait. Businessman Rick Baker makes money from Canadian rationing. People stuck on waiting lists like Shirley Healy pay him to get them to America for treatment. Healy had a blocked artery that kept her from digesting her food. RICK BAKER, CANADIAN BUSINESSMAN: She was starving to death. She'd lost 50 pounds. STOSSEL: She hired Rick to help her get to this hospital in Washington state where she saw an American doctor. HEALY: The doctor said that I would have had only a very few weeks to live. STOSSEL: Yet the Canadian government calls her surgery elective. HEALY: The only thing elective about this surgery was I elected to live. STOSSEL: When this Canadian woman was about to give birth to quadruplets, she was told, "Sorry, all the neonatal units are too crowded." She had to fly to Montana. STOSSEL: After Natasha Richardson fell while skiing in Montreal, she needed a high-tech trauma center but there wasn't one within hundreds of miles. And there were no med evac helicopters to take her to one. STOSSEL: So, yes, our profit-driven system is expensive and sometimes wasteful. But it's that pursuit of profit that's given us inventions that save lives. GRATZER: This is the country of medical innovation. This is where people come when they need treatment. STOSSEL: Thousands come here from countries with government health care. When this Spanish tenor got cancer, he came to America. So did this sheikh from the United Arab Emirates, Italy's prime minister, and Archbishop Desmond Tutu. GRATER: Literally, we're surrounded by medical miracles. Death by cardiovascular disease has dropped by two-thirds in the last 50 years. You got to pay a price for that type of advancement. STOSSEL: Breakthroughs like birth control pills and robotic limbs wouldn't have happened without the possibility of big profit, says Grace Marie Turner of the Galen Institute. GRACE MARIE TURNER, GALEN INSTITUTE: I want companies to come up with cures for Parkinson's, cures for cancer, cures for Alzheimer's. And unless there is a reward for them to do that, we're not going to have those new medicines. STOSSEL: Well, government has researchers. We have the NIH. TURNER: Government is responsible for four percent of the drugs on the market today.